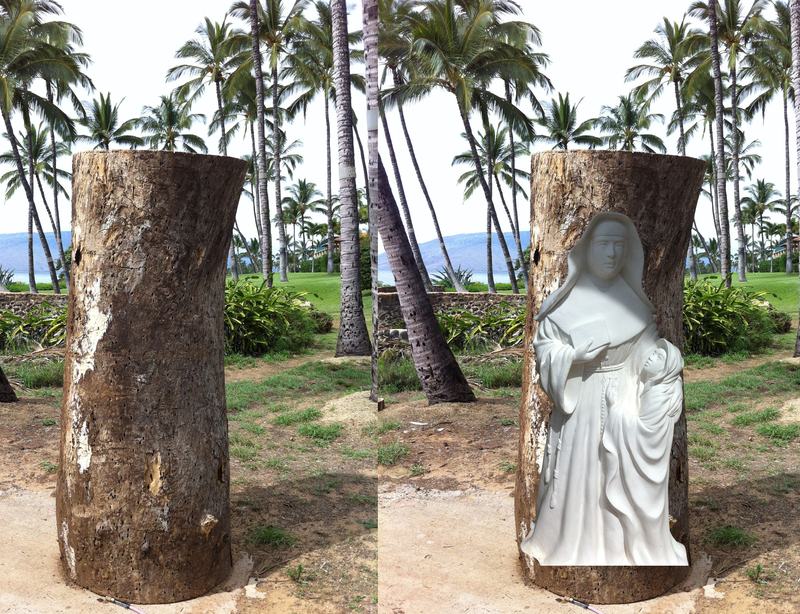 Dale Zarrella’s next project is a statue of Mother (now Saint) Marianne of Molokai. Mother Marianne arrived at Kalaupapa (the leper colony) on Molokai in 1888 after Father Damien contracted leprosy. She tended the dying Father Damien then took over his work for the remainder of her long life. The statue of Marianne will join Dale’s life-size statue of Saint Damien in the Father Damien Museum in Honolulu. On the left is the Monkey Pod tree trunk that will become Dale’s next statue. The image on the right shows Dale’s plaster study for Saint Marianne superimposed over the tree trunk. The half-size plaster study is enlarged here to give an idea of what will emerge from the wood. Click here, here, here, and here, to see other examples of Dale’s work.